Carefully picking his way along a narrow alleyway and stepping over a broken sewage pipe in Guinea-Bissau, police commandant Augusto Nhanga points up at the metal grill above him. "This is where the prisoners get out," he says despondently, pointing to a metal platform roughly constructed within easy jumping distance of the neighbouring house. "They climb up on to the roof and run away." 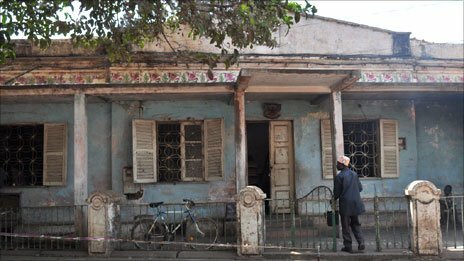 Mr Nhanga is in charge of one of Guinea-Bissau's only detention facilities, an old colonial house in the centre of the capital Bissau, known as First Squadron. It was not built as a prison. In desperation for somewhere to lock away criminals in what has become one of Africa's crime hot-spots, it was turned into a detention centre in 1999. The building has no electricity, no running water and no beds. 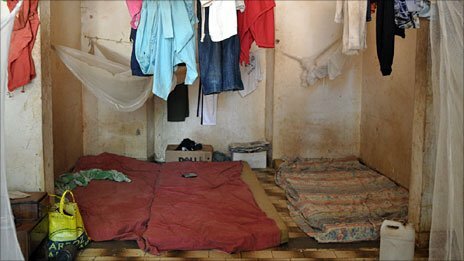 Dank mattresses lie in rows on the cracked and dirty floor, a web of mosquito nets riddled with holes criss-crossing the high-ceilinged rooms. But more notable than the facility's lack of infrastructure is its lack of security. The wooden front door swings limply on its hinges and the gate to the street, just waist-height, creaks open as people freely come and go. The claim by an official in the justice ministry that a prisoner might greet me when I visit the centre, suddenly seems not so ridiculous after all. A row of inmates sit looking haggard and depressed on the front stoop, only Commandant Nhanga and his two unarmed policemen to stop them from leaving. "If I am not here," Mr Nhanga says, explaining that at night he goes home, "people will leave. There is no security here." 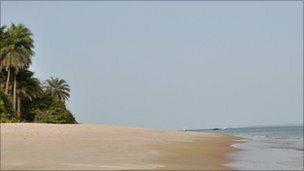 Its ailing infrastructure, weak political institutions and powerful and corrupt military has made Guinea-Bissau a favourite transit country with Latin American drug lords. Criminal cartels bring cocaine through the tiny West African state and smuggle it onwards through local networks to valuable consumer markets in Europe. The country has 88 remote islands off its Atlantic coast, only 21 of which are inhabited, mostly by fishermen and farmers. There is no coastguard and small twin-propeller planes laden with cocaine from Venezuela and Colombia regularly land on the islands before moving the drugs onwards by canoe. The military, largely made up of underpaid war veterans from the 1963-1974 war of independence, disgruntled by government plans to retire them, are known to protect the dealers and profit from the trade. The former navy chief of staff, Jose Americo Bubo Na Tchuto was named by Washington in April as a "drugs kingpin" and barred from doing business with the United States. 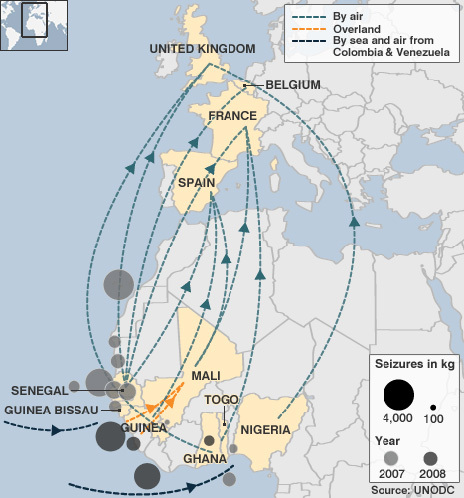 According to latest figures from the United Nation's Drugs and Crime Office (UNODC), 2.3 tonnes of cocaine passed through West and Central Africa in 2008. Last month more than two tonnes were seized during a single haul in The Gambia. But while narcotics trafficking is rife in the country of 1.5 million, very few foreign drug traffickers have been brought to justice. The laws are there to convict foreigners but with traffickers bringing in quantities of cocaine that dwarf the country's GDP in a single deal, once caught, the traffickers quickly disappear. "The unlimited budget of foreign drug dealers makes it very easy to corrupt people," says Manuel Pereira of the UNODC in Bissau. "It's easy not to be in prison in a place without prisons. The suspects disappear and without suspects there is no file. With no file the case is dismissed." But now Guinea-Bissau is getting some new prisons. The UNODC and the country's justice ministry have rehabilitated two purpose-built prisons which will be the country's first secure penitentiaries. Local prison guards are currently being trained; the prisons should be ready to receive their first inmates in September. The new prisons at Bafata, 100km (62 miles) from Bissau, and Mansoa, 40km (24 miles) will be the biggest and most visible achievement under the UN Peacebuilding Fund for Guinea-Bissau, says Mr Pereira. The 30 inmates from Commandant Nhanga's First Squadron detention centre will be transferred to Mansoa where they will be held four to a cell and enjoy recreation facilities, electricity, running water and three meals a day. Although this is something few Guineans currently enjoy, Basilion Sanca of the Ministry of Justice says the prisons will still be a deterrent. "The worst punishment for a Guinean is not to be a part of society," he says, pointing out that at the moment, prisoners do not feel divorced from their communities as they are allowed daily visits from their families who bring them food. "With these new prisons, criminals will know that they are in a prison they can't run away from." As well as Bafata and Mansoa, two more prisons are being rehabilitated, each holding around 30 people - and the UNODC is awaiting funding for a fifth which will hold around 200 people. The hope is that these prisons will add some sense of security to the country and deter foreign drug traffickers. "Everything we are doing is to strengthen the judicial system, to guarantee the security of the country," says Justice Minister Mamadou Saliou Galo Peres. "We can't take on these kinds of reforms without having hope that we can fight all kinds of crime." But after the United States recently pulled out support for the $200m (£133m) security sector reform when Guinea-Bissau's president named the leader of the 1 April coup attempt head of the armed forces, it is clear that these prisons are just one small step in the reform of the country's security sector. "The new prisons will detain both foreigners and nationals," said one justice ministry official, who asked not to be named. "The laws are applicable to both. "But the problem is not about the detention of prisoners; it is about the proper functioning of the justice system. "The real problem is much higher up."